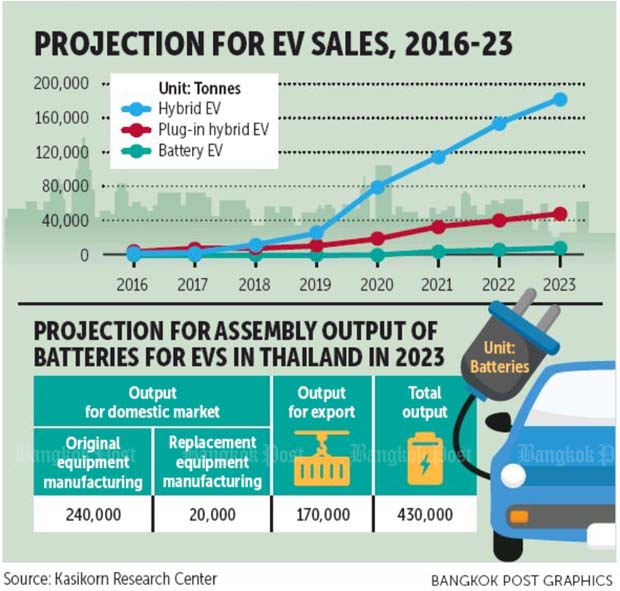 Kasikorn Research Center (K-Research) forecasts the assembly and output of batteries for electric vehicles (EVs) in Thailand will stand at 430,000 units by 2023, putting the country in the top four in Asia, The Bangkok Post reported. With that level of production, Thailand would account for 3% of global battery production in five years. The research house projects EV sales in Thailand covering the three platforms of hybrid, plug-in hybrid and battery EVs will account for 25% of the total car market, equal to 240,000 cars by 2023. The EV population is forecast to reach 820,000 cars in Thailand by 2023. "The EV market is expected to increase significantly from 2019 as many car manufacturers have applied for the Board of Investment's [BoI] incentives to localise EV assembly," K-Research said. "The application period for the government's EV scheme expired in 2018. Investment flows are coming this year, one of which is for EV-related battery assembly." The research unit said the initial stage of the EV scheme is focused on hybrid and plug-in hybrid platforms because some carmakers localised and implemented their plans last year, such as Toyota, Mercedes-Benz and BMW. The assembly lines for battery EVs will need some lead time and depend on widespread coverage of EV charging stations, said K-Research. "The BoI has time frame conditions, requiring each applicant to implement the plan within three years after being granted incentives, which means no longer than 2021," K-Research said. "For hybrid EVs, local sales can grow significantly from 2019 because this technology has been ready for several years and the government may add some hybrid segments such as eco-hybrid and mild hybrid for eco-cars." Once eco-cars qualify for tax incentives from the add-on programmes, their price tags will be competitive enough to raise sales volume locally, K-Research said. Both eco-hybrid and mild hybrid models will come with strict conditions to develop and upgrade battery EVs within three years. Assembly manufacturing for EV batteries will become key as car manufacturers are working closely with battery companies to develop higher capacity and more efficient EV batteries for the Thai market, according to K-Research. Some carmakers also applied to localise battery assembly together with EV plans, such as Toyota and Mercedes-Benz. Of the total battery output, projected at 430,000 units in 2023, K-Research said the domestic market will demand 260,000 EV batteries -- 240,000 units for original equipment manufacturing and 20,000 units for replacement equipment manufacturing. Thailand's EV battery production will make it a hub for exports, with the research house projecting shipments of 170,000 batteries in 2023, representing 40% of total production. K-Research said the major destination for local-assembled EVs in the initial stage will be Japan as the EV market in that country is expanding and some Japanese carmakers have chosen Thailand as an export hub. Other destinations for Thailand's EV exports will be Oceania, Singapore and Malaysia, because they have high-income earners who can afford EVs. "These countries are experienced with EV technology and their governments are investing in expanding EV charging stations," K-Research said. "China is another EV destination for Thai exports as that country is the world's largest EV market. Some European carmakers are expanding their local facilities to ship EVs to China." Regarding EV shipments to Europe, K-Research said Thai-assembled cars will face aggressive competition because European manufacturers are accelerating EV production and Thailand does not have a free-trade agreement with that region. For EV battery exports, Thailand can become a global hub to serve Oceania and Southeast Asia markets. In the past, EVs and vital battery components were only produced in major car manufacturing countries -- China, South Korea, Japan, the US and some countries in Europe. K-Research said Thailand's initial battery production is for exports, with a focus on EV replacement parts sold in Oceania and Southeast Asia countries, particularly for hybrid and plug-in hybrid EVs. In addition, Thailand will soon be the original equipment manufacturer EV battery hub for Japanese carmakers, bolstered by the Japan-Thailand Economic Partnership Agreement. Japan's battery manufacturers will shift to Europe because of a free trade agreement. 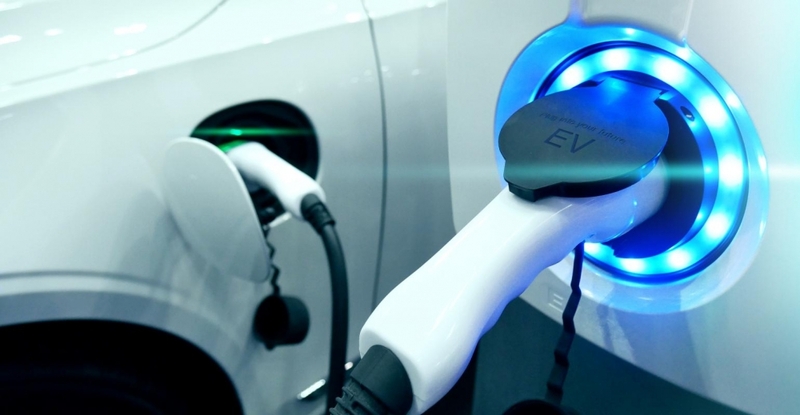 K-Research said once Thailand progresses with EV battery manufacturing, the government should accelerate its plan to set up a fund to support the EV industry. Can You Handle These 5 Spiciest Foods in Southeast Asia?